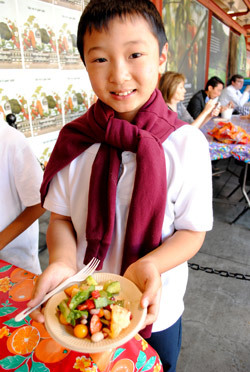 Foodwise Kids is a free program for elementary school classes that uses the Ferry Plaza Farmers Market as a classroom for empowering the next generation of healthy eaters. Through comparative tastings, exploring the market, and a hands-on cooking lesson, we nurture children’s love for fruits and vegetables, teach them to prepare healthy, seasonal foods, and raise their awareness of their role in a sustainable food system. 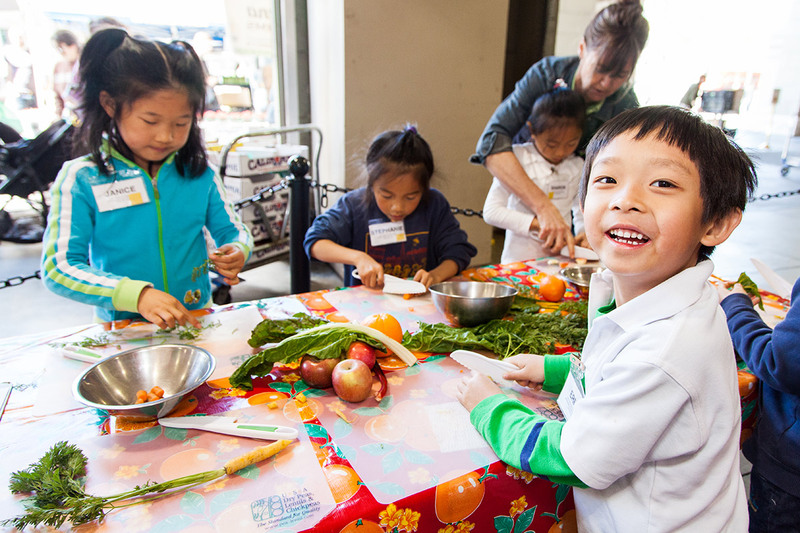 Foodwise Kids field trips begin with an introduction to the Ferry Plaza Farmers Market and California’s growing seasons. Students whet their palates with a produce tasting that features fruits or vegetables likely to be unfamiliar, and are urged to be open-minded and to engage their five senses. Next, students use their sense of smell to carefully practice adding flavor using liquid and dry ingredients. 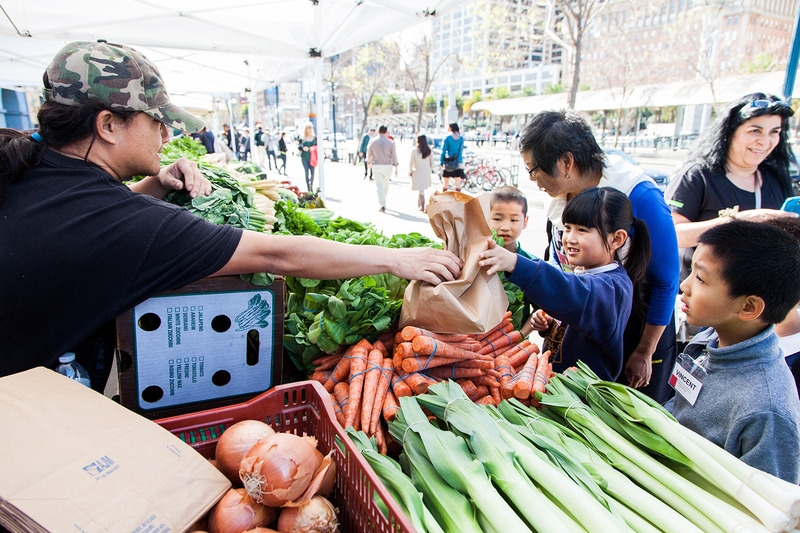 Students then venture into the market in small groups with their chaperones to select produce for their cooking class, using tokens provided by CUESA. They complete a worksheet that encourages them to meet farmers and learn more about their food and how it is grown. Armed with produce and newfound knowledge, the children return to the kitchen to make a snack. Education Program Coordinator Tessa Kappe and CUESA interns and volunteers teach basic cooking skills, such as how to make a vinaigrette and properly use a knife. The students prepare a snack in small groups, using the ingredients they purchased. At the end of the class, the students proudly share their dishes with their classmates, teacher, and chaperones. Since the Foodwise Kids program launched in fall of 2012, more than 10,000 students from local public elementary schools have participated. The Foodwise Kids program is free to public school grades 1 through 5, with classes up to 35 students. It take place on Tuesdays and Thursdays from 10 am to 12:30 pm or 10:45 am to 1:15 pm. Priority is given to schools with a high rate of eligibility for free and reduced-price lunch. The program is offered during the school year to elementary classes and during the summer to community organizations. We’re now scheduling for the 2018-2019 school year. We’re looking for individuals who love cooking and working with children to assist at our Foodwise Kids classes on Tuesdays and Thursdays. Read the description of duties here. Contact Youth Education Manager Tessa Kappe at tessa@cuesa.org for the next steps in volunteering.